Many people think that the core of Christian faith involves believing that Jesus was the Christ, the Messiah predicted by the prophets. I think Rev. James Antal* was correct when he said that faith also involves experiencing oneself as a child of God. We have been taught how to do this by Jesus Christ, who was tempted in every way just like us and showed us how to live reconciled with one another in the absence of scapegoating. Experiencing ourselves as children of God invariably encourages works that reflect one’s reverence for God, the loving parent. How could those who experience themselves as children of God, upon learning about the inherent cruelties of factory farming and upon learning that God takes delight in all God creation, continue to eat the products of factory farming simply for taste? We live in a fallen world of pain, suffering, and death. Clearly, a God who loves the world would not be satisfied with the current state of affairs. This is why Jesus chose to heal an invalid man on the Sabbath, explaining to critics, “My Father is working still, and I am working.” John (5:17) By healing on the Sabbath, Jesus dramatized that the work of Creation was not completed. This, I think, is why Jesus prayed for the coming of God’s kingdom “on earth as it is in heaven” (Matthew 6:10). 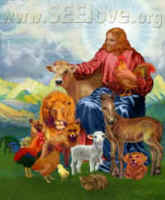 If one has faith in a living, working God, one loses faith in the inevitability of things, which includes both the belief that human progress is impossible (as some despair) and that human progress is inevitable (as defenders of many of our environmentally unsustainable activities, such as factory farming tell us). More to the point of this essay series, faith in a living God eradicates faith in the sacredness of the social order. People have always established boundaries, such as racial, ethnic, and class boundaries, over and against other people (see essays 6 & 7). They have regarded these social strata as sacred – ordained by the divine. However, a living God repeatedly disrupts rigid social boundaries. This is why Jesus repeatedly showed greatest interest in his community’s outcasts – women, people with disabilities, tax collectors, etc. This was indeed scandalous, and Jesus remarked, “blessed is he who takes no offense at me.” (Matthew 11:6) after healing blind, lame, leprous, deaf, and dead people and after preaching to poor people. The opposite of taking offense is having faith. In order to have faith, one must accept the possibility of offense; otherwise, faith is vacuous. This, I think, was the message encapsulated in the story of the Canaanite woman (Matthew 15:22-28). As a Canaanite, she was despised by the Jews, and after she asked Jesus to heal her daughter, Jesus compared her to a dog. She persisted in her request, showing that she was not offended, and Jesus, impressed by her faith, healed her daughter. We have faith in Christ not because the living Christ is scientifically proven. If it were, it would not be faith. We have faith because, in the face of a world of obvious suffering, decay, and death, we still believe in God’s power to heal and, ultimately, to redeem Creation.